16-18 Division Champion Wyatt Nicholson, of Meigs High School, with Ed Caudill. 10 and Under Division Champion Alec Conway, of Gallia Academy Middle School, with Ed Caudill. 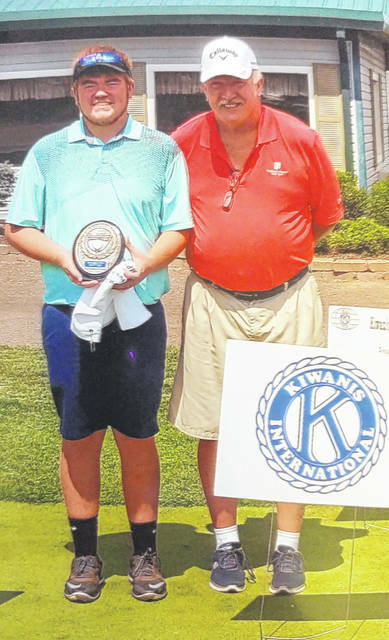 GALLIPOLIS — The tenth annual Kiwanis Juniors at Cliffside Golf in Gallipolis concluded with winners coming from Gallia, Meigs and Washington Counties recently. 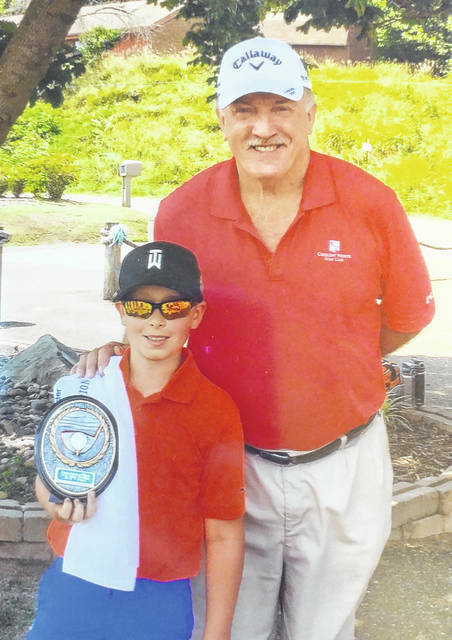 The 10 and Under Division was won by defending champion Alec Conway, of Gallia Academy Middle School, shooting a 43. Grant Roush, of Mason, a former Kiwanis champion, fired a 45. Finishing third was Teegan Conway, of Gallia Academy Middle School. The 11-12 Division was won by Kensie McComas, of Barboursville Middle School, with a 62. Second place went to Evan Page of Gallia Academy Middle School, 68, and third to Matt Lawrence, Gallia Academy Middle School, 71. The 13-15 Division was won by Chance Weihl, of Warren Local School District, with an 82 and was followed by Camden McComas, of Cabell-Midland, with 90. Third place went to Trent Peacock, of Meigs High School. The 16-18 Division was dominated by Meigs County linksters led by Wyatt Nicholson, of Meigs High School, with an 80. Kylee Tolliver, of Eastern Local School District, fired a 90 for second place, followed by Jensen Anderson, of Southern High School, who finished third with a 96. The 2019 Kiwanis Juniors at Cliffside Golf is tentatively set for July 11, 2019. Changes for next year anticipate 13 to 15 year-olds to play with white tees instead of blues for 2019. Tournament information for 2019 can be found at southeasternohiopreps.com golf forum.